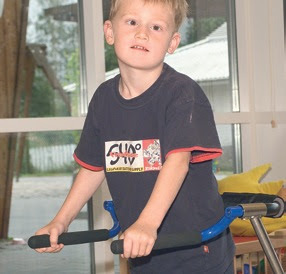 R82 A/S of Denmark and Snug Seat combined in 1998 to form the world’s largest manufacturer of rehabilitation products for children with special needs. Snug Seat and R82 truly care about children and are continuously developing new products to make their lives more fulfilling. The Gator is a child's gait trainer. It offers accessories that let you craft the walker to your needs. Some people refer to them as Reverse-Walkers, but it's really a Posterior Gait Trainer with a frame that goes around the sides and rear of the user. The user is in the center of the walker. The Gator Walker from Snug Seat provides superior ambulatory training and a psychological edge over the standard anterior-type walkers where the walker is out front. The Gator Walker is a strong and stable gait trainer often chosen when a heavier more stable base is required. The unique design of the Gator frame allows for a growth capability not available on competitive units. It is accomplished with rotational hand grips, and a height adjustable back frame.